Costa Rica is the ideal country for anyone to relocate to that is conscious about their footprint on mother earth. Costa Rica is the perfect place for anyone looking to retire and they can even do it on a budget when saving money living a greener lifestyle. This pristine piece of paradise is very popular for tourism coming to see the abundance of wildlife and beauty within. The countries residents and government are very conscious about keeping Costa Rica as beautiful as it was before tourism became the number one income earner for the country. You must learn how to become more sustainable before you step foot in this country in order to pay your full respect. This is a peaceful country where you will rarely find a negative confrontation. In fact, Costa Rica renounced their army in in 1949 making it one of 15 countries with no army. The prior military budget was put towards culture, health and education. The most popular words that come from every one’s mouth is “pura vida” This translates to pure life and seems to be a way of life for laid back locales. Costa Rica is rich in bio-diversity from coast to coast. The country is incredibly small with only 19,730 square miles. That equals .03% of the surface of the globe. However, the country is proud to say that it is home to 5% of the total biodiversity in the world. Over 25% of the countries land is protected by national parks and conservation areas. The government even pays landowners to conserve their own private land, this is referred to as “selling the air, yes you can even make extra money while doing your part to save the planet in Costa Rica. Roughly 50% of Costa Rica is forested and 7.5% of that is classified as primary forest. Primary forest is the most bio-diverse forest known or unknown to man whichever way you look at it. Primary forest means that there are no clear indications of human activities and the ecological processes are left undisturbed. 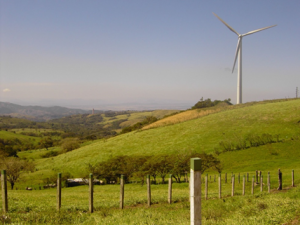 When you turn on the lights or use any sort of electricity in Costa Rica you can feel a little better about your decision knowing that the country runs nearly 100% on renewable energy. In 2016 the country ran for more than two months straight on 100% renewable energy. They accomplished this task twice. That means the country ran for 150 days on 100% renewable energy. One of the biggest goals for the country is to be completely running on renewable energy in the near future. Costa Rica is giving huge incentives for those looking to go green and import an EV. Import custom duty taxes of 52.29% on new vehicles and 79% for vehicles 6 years or older make vehicles super expensive in Costa Rica and fully electric vehicles under $30,000 are 100% exempt from customs taxes. Also, there is a 10-year exemption for EV parts. The country does capitalize on the natural ecology for tourism that is for sure. There is an abundance of eco-tours to choose from. The most popular eco-tours are the nature tours such as monkey tours, tree top tours, crocodile tours, and turtle tours. Many of the beaches are protected areas for turtles to nestle, only certain guided tours are allowed to explore these beaches. It is highly recommended that a guide accompanies you into the wild because there is so much that you would miss if you were all alone. There are 9 volcanoes in Costa Rica and all of them are a sight to see. The most popular and spectacular ones are Poas, Irazu, and Arenal. Turrialba has recently been active in 2016 and the beginning of 2017 canceling some flights in and out of the San Jose International Airport. Manuel Antonio National Park is the most visited park in the country and is only 45 KM from Dominical. There are 184 species of birds in the park and 109 species of mammals. Monkeys are the main attraction and you are certain to spot one when visiting the park. The trails within the park are in great condition offering an easy path for elders to enjoy the scenery. The white sand beaches within the park are the perfect place to relax for the day. One of the best ways to really appreciate the land is to join a tour that teaches you all about the agriculture in Costa Rica. There is an organic pineapple tour and organic coffee tours. Saint Michaels Organic Farm offers free education for sustainable farming, they also welcome volunteers looking for a free place to stay, look for them on WWOOF. Adventure meets eco-tour with the affluence of zip line canopy tours in the country. Many people don’t know it but zip lining was first invented in Costa Rica. Biologists first used this method in Costa Rica to access previous unreachable and unexplored rainforests. Posted in Costa Rica, News and tagged bio-diversity, eco-friendly, electricity, footprint.